A Casablanca (Warner Brothers, 1942) Insert nearly doubled its pre-auction high estimate when numerous bidders drove its final price to $102,000. DALLAS, Texas (November 26, 2018) – A Casablanca (Warner Brothers, 1942) Insert nearly doubled its pre-auction high estimate when numerous bidders drove its final price to $102,000, claiming top-lot honors in Heritage Auctions’ Movie Posters Auction in Dallas. The total value of the auction, which boasted sell-through rates of 97 percent by value and 96 percent by lot, was $1,602,103. The 14-by-36-inch high-demand poster was widely anticipated prior to the Nov. 17-18 auction. Part of the appeal to collectors is the fact that this poster features all of the film’s main characters, including the leads played by Humphrey Bogart, Ingrid Bergman and Paul Henreid. The film went on to become one of the most important films in Hollywood history, developing an enormous base of fans and collecting several Oscars along the way, including Best Picture, Best Director and Best Screenplay. 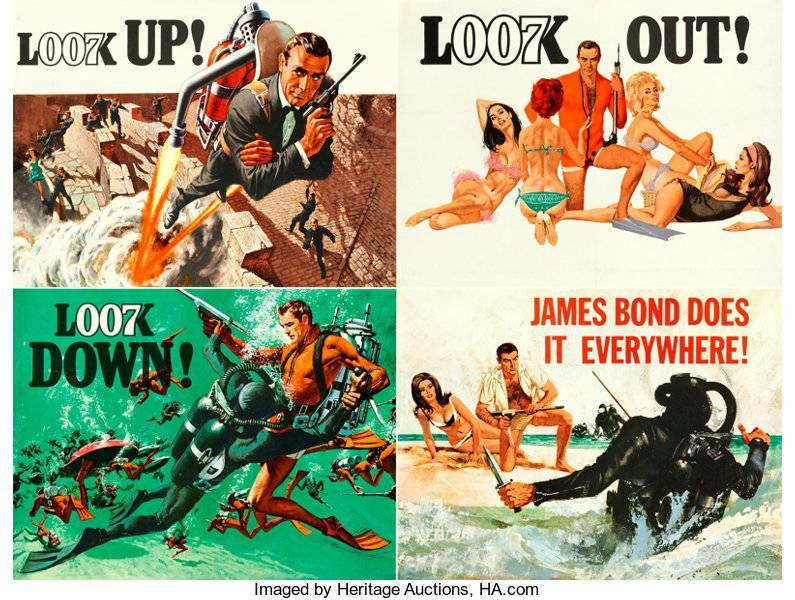 This extremely rare poster from Thunderball sold for $24,000. An extremely rare, highly sought-after Thunderball (United Artists, 1965) full-bleed British quad more than doubled its low estimate when it sold for $24,000. Multiple collectors made bids for the poster with artwork by Frank McCarthy and Robert McGinnis. This country-of-origin British paper, in advance quad crown style, captures Sean Connery in his fourth – some say his best – performance as James Bond. Only a small number of copies remain uncut. This poster was advertised in the British pressbook as the Quad Crown poster, intended to be cut by theater owners into double crown posters (no double crown posters were distributed for the promotion of the film). A Breakfast at Tiffany’s (Paramount, 1961) Italian 4 – Fogli drew bids from more than a dozen collectors before nearly tripling its low estimate at $22,800. The 55-by-78-1/2-inch poster, offered for the first time through Heritage Auctions, features a beautiful portrait of Audrey Hepburn by Ercole Brini, who was widely considered one of the best artists in the business. A Superman Cartoon (Paramount, 1941) Stock One Sheet also drew numerous bids before closing at $20,400. The 27-by-41-inch poster was created by Paramount with a blank imprint area in which the name of any of 17 individual Superman cartoon shorts could be written or printed. This Creature from the Black Lagoon (1954) movie poster sold for over $19,000. A dozen collectors made bids on a Creature from the Black Lagoon (Universal International, 1954) Six Sheet with artwork by Reynold Brown until it drew a final price of $19,200. 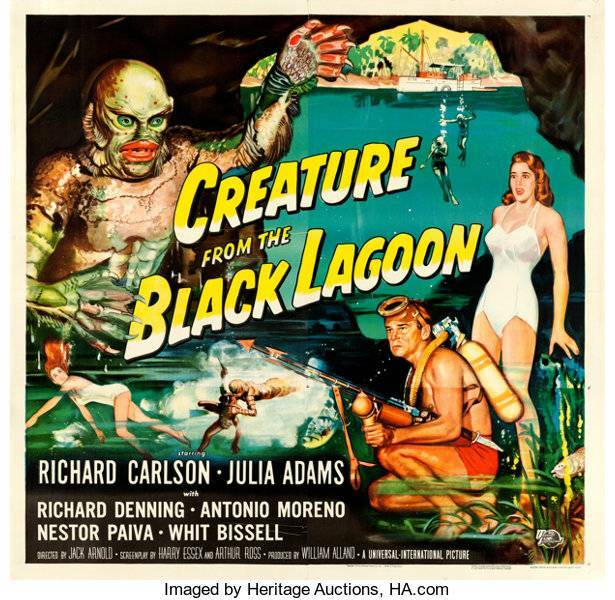 The horror classic stars Richard Carlson, Julia Adams and Richard Denning as a group of paleontologists who travel to the Amazon and find the famed Black Lagoon and its most unusual occupant. The film was one of the era’s finest and inspired two sequels, and this poster in its large format may be in the best condition of its kind.